Belting is a singing technique by which a singer sings higher pitches using his or her chest voice. The results are louder and stronger than what can be achieved with low head voice. Voice has two main registers; head voice and chest voice. The head voice represents sounds of a higher register while the chest voice lets you talk in the lower register. Some people refer to belting as “high Chest Voice” which is technically incorrect. If belting doesn’t come out naturally it is possible to learn how to belt without straining your voice, all you have to do is to follow a good belt exercise. One of the biggest challenges that most singers face while belting is pressure coming from the throat. Belting requires one to use less breath pressure and not strain so hard to sing the vocals. For the best results in belting, breathe so deep and fill your lungs with air, Use that air to power up your notes. The larynx is a very sensitive part of your body, so if you are adding more air pressure to your lungs, make sure that you are doing everything right. Learning how to close and open your throat will help you learn how to belt. Most people are not aware of how powerful the head muscles are. Singers who can belt at high voices know how to use those tiny muscles of their head. When practicing how to belt, use your neh-neh sound and make a long deep. Feel how much air is coming out when you sign. Doing the neh-neh with an open throat will make your voice sound good, but if you do it with a closed throat, your voice will sound too harsh. Any form of pushing, squeezing, yelling, extreme nasality and squeezing can lead to musical and vocal health problems. Great belters don’t sing under pressure. If you want to sing good notes you have to stay relaxed and calm. Most singers tend to hold unconscious tension on their face, shoulders, neck, etc. You have to shake off that negative feedback and keep your mind tension-free to make good belts. Just like a soprano hits her highest notes, you also need to trust your higher chest notes when belting. Don’t force your voice or push your notes at all, staying calm and confident will enable you to sing those notes with a great voice. Your head, body, and face should be in harmony in a way that will make you more comfortable to belt. A higher sound requires one to use more energy and do more activities to belt properly. Belting is also an athletic experience, and it requires one to have good stamina. Just like singing large opera roles, belting also requires you to use your body energy when singing those notes. Most singers can’t belt naturally and if you happen to be one of them just do some few practices, and you will be able to perfect your skills over time. To avoid being tired, make sure you build up enough endurance that will enable you to focus with your belt when you feel exhausted. Regular practice will help you to build your stamina over time. In any new physical activity, stamina builds slowly, and you should have some patience to see any good results. If you want to sing those notes with a good voice, learn to keep your mouth wide open. A singer who’s mouth is wide open finds it easier to learn how to belt. To project your sound, place your tongue near or around the back of your bottom front teeth. Make sure you don’t spatulate your tongue, flatten it with a spatula. 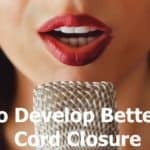 You have to develop a healthy belting voice to prevent jeopardizing your vocal cords in the long run. A healthy mix belting voice is produced with a powerful and intense trumpet-like sound without causing any stress or fatigue to the singer. It requires singers to use the proper breath techniques and strong abdominal muscles to belt through the song smoothly. Chest voice and belt are quite related in some ways, but they are not the same thing. Belt only uses a little of chest voice and not whole pure chest voice. Mixing means that one is combining different registers. Healthy Belting is not a combination of different voice registers. The term mix belting is used to help people understand that belting does not use pure chest voice. Mixing is the main reason why most Broadway star can belt extremely high without losing their voices. It also enables some singers, both trained and untrained to be able to belt naturally without hurting themselves. If you want to learn the advanced techniques of how to mix, get help from a voice teacher and train with her. 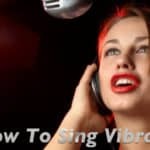 You can apply some vibrato techniques in belting to make your belting voice more powerful without been seem like yelling and screaming while singing. The vibrato represents a steady pitch fluctuation of the voice while singing. Sometimes the pitch can be extended to the highest pitch in a singer’s range to achieve vibrato. When belting there is no continuous vibrato when the singer is singing sustained notes, except when he or she is adding color to the sound. Vibrato does not involve moving your mouth. When you hit your notes, always make sure that your vibrato is tact. It needs to be in your throat where you can feel it vibrating as a natural part of your voice. If you can sing your notes with a straight tone, just know that can hit with a vibrato. When done incorrectly belting can lead one to so many problems and health conditions. There have been many occasions where singers have reported constriction of the muscles surrounding their vocal mechanism due to incorrect belting. If you are new to belting and just started learning how to belt, look for a good instructor or musical teacher who can help you become a great belter. Singing is a very simple talent that doesn’t require one to strain or stress himself to perform flawlessly. Most musicians are born without the skills of belting, and they acquire them through practice and regular training from a musical teacher. When vocal muscles constrict due to incorrect belting, a singer might experience some deterioration and uncomfortable muscle aches. Correct use of vocal muscles and retraction of the ventricular folds is crucial when practicing safe belting. Most singers who belt have very little control over their voices. 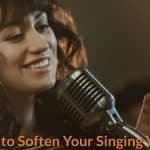 When you sing softly due to technical under development, you might harm your vocal apparatus which can eventually make your voice sound thin, shaky and weak. Without good training belting can result in serious complications that might require urgent attention from a doctor, so when belting makes sure you follow all the safety rules regarding safe belting.